Cherry Mobile T8 will be on sale on December 15-18, 2011 wherein you can grab this dual sim, touchscreen and TV phone for only Php1,999 (Php 1,500 off its original price of Php3,499). This Christmas, Cherry Mobile lets you keep in touch with the mobile world as it brings Touchscreen and TV phone T8 to its lowest price ever! Send a greeting to everyone with just a simple touch of your fingers with T8’s 2.6” Touchscreen Display. It also has a Mobile TV with Recording so users can enjoy their favorite shows this season and all year round. Cherry Mobile completes this special Christmas sale with other nice touches such as Multimedia Player, Wireless FM Radio with Recording, G-Sensor, Java, Built-in Games, Bluetooth and expandable memory storage up to 8GB. 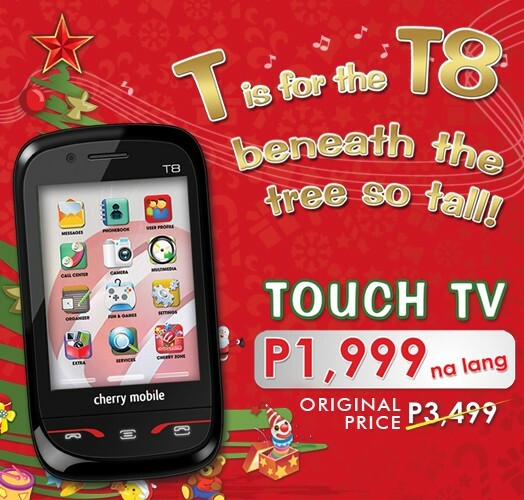 Be in the loop this Christmas with Cherry Mobile T8, now only Php1,999. Promo period is from December 15-18, 2011 and will be available in all Cherry Mobile concept stores and kiosks nationwide.